In the opening verses of the book of Acts we learn that Jesus’ mission is historically-true, witness-driven and kingdom-focused. Luke is clear. While his gospel was about what Jesus began to do and teach, this book – Acts – is about what Jesus continues do and teach through His Spirit-empowered people. The gospel accounts of the life of Jesus (Matthew, Mark, Luke, and John) tell the story of what he “began to do” (Act 1:1), but the book of Acts tells the story of what Jesus continues to do by the Holy Spirit. It’s a story that continues to unfold to this day, in our city and the cities of the world. It is perhaps the most exciting book of the entire Bible as it recounts the days following the resurrection of Jesus Christ, the foundation of the early church, the expansion of the gospel to the edges of the known world, and God’s powerful Kingdom-advancing work through unlikely people – people like us. Acts serves as the hinge of the New Testament, bridging the gospels with the letters, giving us insight into the personality of Paul and the context of all his writings. This incredible book also provides foundational insight into the areas of church planting, evangelism, the work of the Holy Spirit, spiritual gifts, spiritual warfare, and the power of prayer. We’ll also encounter issues such as cultural engagement, church government, opposition of Satan, persecution from men, and the freedom, joy, and victory that are ours in Jesus as we follow Him. Not surprisingly, we’ll also learn more about the gospel, including the centrality of the resurrection, the importance of cities and the role of God’s people in its spreading. It’s going to be a great series. The book of Acts forms a 2 volume set w/ Gospel of Luke. Both were written by the Luke. He was a Gentile (non-Jewish) doctor, and traveling companion of Paul. Interestingly, he is the only Gentile contributor of the NT. He wrote Acts around 60AD, only 25-30 years after Jesus’ death. Word for word, Luke writes more than any other author – including Paul – 1/4 of NT. 1:1 “Theophilus” (“friend of God”) was likely a Roman official and convert under the ministry of Paul. He may have funded Luke’s writing project. 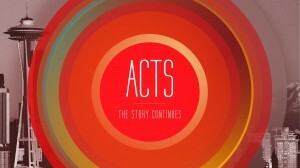 Acts is about Jesus’ continuing ministry from heaven by Spirit thru his people. “Luke’s first two verses are, therefore extremely significant. It is no exaggeration to say that they set Christianity apart from all other religions. These regard their founder as having completed his ministry during his lifetime; Luke says Jesus only began his…after his resurrection and ascension, and gift of the Spirit he continued his work, first and foremost through the ministry of his chosen apostles and subsequently through the post-apostolic church of every period and place. This then is the kind of Jesus Christ we believe in: he is both the historical Jesus who lived and the contemporary Jesus who lives.” John Stott, The Message of Acts, IVP Press, 1990. While there are four accounts of the life of Jesus, there is only one account of the early church. This makes the book of Acts invaluable. John Calvin called Acts, “a kind of vast treasure”. It covers an amazing amount of territory, 25-30 years, in only 28 chapters. 30% of the book is preaching. The structure of the book is framed by Acts 1:8 “You will be my witnesses in Jerusalem, Judea and Samaria, and to the ends of the earth…” The book shows how the message of the gospel expands out of Jerusalem, into Judea and Samaria (areas immediately around Jerusalem) to the edges of the known world – and continues to do so today. In the opening verses of the book of Acts (1:1-8) we learn that Jesus’ mission is historically-true, witness-driven and kingdom-focused. Jesus’ mission is witness-driven. (Acts 1:8, Luke 24:48) In other words, Jesus primary tool for his mission are those who have personally encountered him. He calls the “witnesses” (Acts 1:8). Though the Apostolic office is closed, we too are called to serve as Holy Spirit-empowered witnesses. Serving as a witness is not merely one element of our existence as the church; we exist to be witnesses. We are God’s Plan A in Seattle, serving as witnesses to what He has done and the radical grace he offers. Jesus teaching here is summarized as “speaking about the kingdom of God”. The kingdom of God is his absolute rule and reign over all that is. Jesus’ ministry was spent inviting all who would hear into the Kingdom (i.e. to personally accept his gracious rule and reign). So, the Kingdom is not one sector of human affairs or one thread within the entire tapestry of human history. Rather, it refers to the origin, purpose and meaning of the entire universe. So, Jesus’ invitation is an invitation into the purposes of the universe – as those purposes are summed up in Him. The gospel is a call to enter into the Kingdom of God by personally submitting to the gracious rule and reign of Jesus in your life. In sum, Jesus mission is historically-true, witness-driven and kingdom-focused. Jesus is still at work, here and now. The story that began in Acts continues and we are writing the next chapter in our generation, in our city. We exist to be witnesses. God works through normal, ordinary people to expand the news of his kingdom, but calling us out of our own stories into the one story of God.